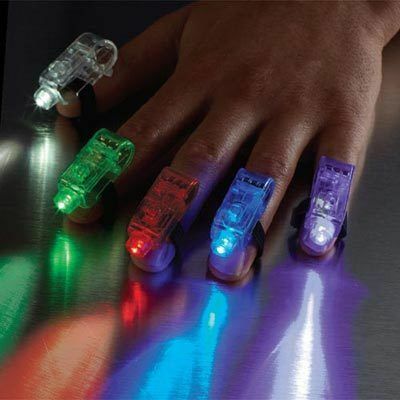 A light show at your fingertips! Fun for parties,long-exposure photography, outdoor concerts. Use these Finger Light Lasers again and again! Bright LED bulb mounted in case, held with elastic strap. Set of 5 includes one of each: Purple, Blue, Red, Green, and Clear. On/off switch. Uses button cell batteries (included). Ages 6 and up. 1½"l; one size fits most. Hurry! Quantities are limited!